The son of an Australian filmmaker detained in Cambodia for 12 months without trial says now is a “critical juncture” for the Australian Government to put diplomatic pressure on the Hun Sen regime. James Ricketson was arrested on the evening of June 3, 2017 and charged with espionage. He has now spent a year in pre-trial detention, waiting for a Cambodian judge to investigate his case. “The evidence has been gathered, the investigation has now been closed and so we are at this critical juncture now where the Cambodian legal system can show us that justice can be done,” Mr Ricketson’s son, Jesse, told the ABC’s 7.30 in an exclusive interview. Jesse Ricketson has uprooted his life in Sydney and moved to Phnom Penh to be able to visit his father in prison. 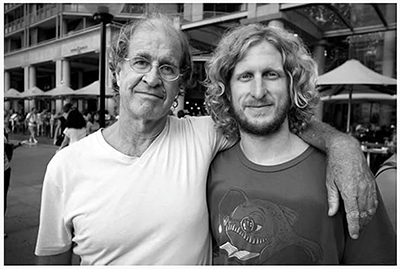 James Ricketson, 69, is currently in the prison hospital due to a chest complaint and various skin problems. But the medical treatment is extremely limited and any serious illness could be “a disaster”, his son said. “Worst case scenario is he could die in there,” Jesse Ricketson said. He regularly makes the 40-minute trip to Prey Sar prison, taking food, money and books. But the ordeal is taking its toll on his father’s mental state. James Ricketson has been visiting Cambodia for more than 20 years, making documentaries and helping impoverished Cambodians. “One of my dad’s best qualities is that he cares about people,” Jesse Ricketson said. Jesse Ricketson, 36, dismisses the espionage charge that carries a possible 10-year sentence. “My father is not a spy, 100 per cent categorically not a spy, and there’s no evidence that supports the charge against him,” he said. 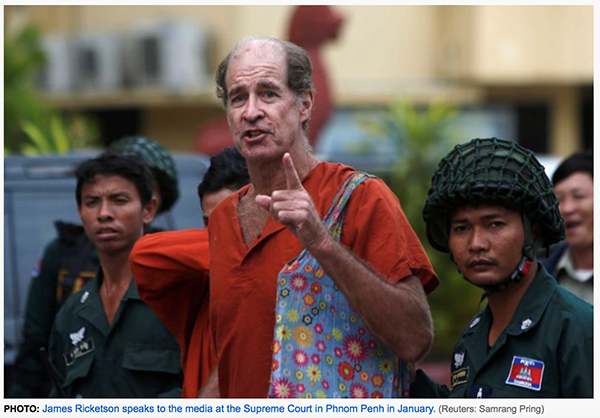 James Ricketson’s incarceration comes at a tense time in Cambodia, with an election next month. Prime Minister Hun Sen has banned the opposition party, jailed its leader and has threatened civil war if his party is not re-elected. It seems James Ricketson’s strong opinions online and his interest in the opposition has put him in the crosshairs. One Australian who has been through a similar ordeal is journalist Peter Greste, who spent 400 days imprisoned in Egypt. “I think it’s shocking. We haven’t seen any clear evidence yet that James is guilty of any offence that justifies this kind of imprisonment,” Mr Greste told 7.30. “I feel for him. I know what it’s like to be stuck in prison for such a long time with an uncertain future. “The Australian Government and Julie Bishop have been very keen to take a very prominent role in the Human Rights Council, talking about freedom of the press and other human rights issues. In handwritten letters — often written at night when other inmates are sleeping — James Ricketson has complained that the Australian Government isn’t doing enough to help. Australia’s Foreign Minister Julie Bishop rejected the accusations. “I have raised Mr Ricketson’s case at the highest levels, including by writing to my Cambodian counterpart Minister Prak Sokhonn,” Ms Bishop said. She said Mr Ricketson’s case was raised with the Cambodian Government at the ASEAN-Australia Special Summit in March.